Hooray! Simple Hashbrown Casserole is my first (of many?!) Instant Pot recipes to share. But guess what else? I’m well aware that not everyone has an Instant Pot, so I’m also providing instructions for baking this in an oven. Not only that, because there are times we might need a slower cooking option (like, if we need to get dinner started, then head out to ball games, then come home to a cooked meal) – so I’m also including Crock Pot cooking instructions! As best I can, I will provide all these options each (or most of the) time I share an Instant Pot recipe. 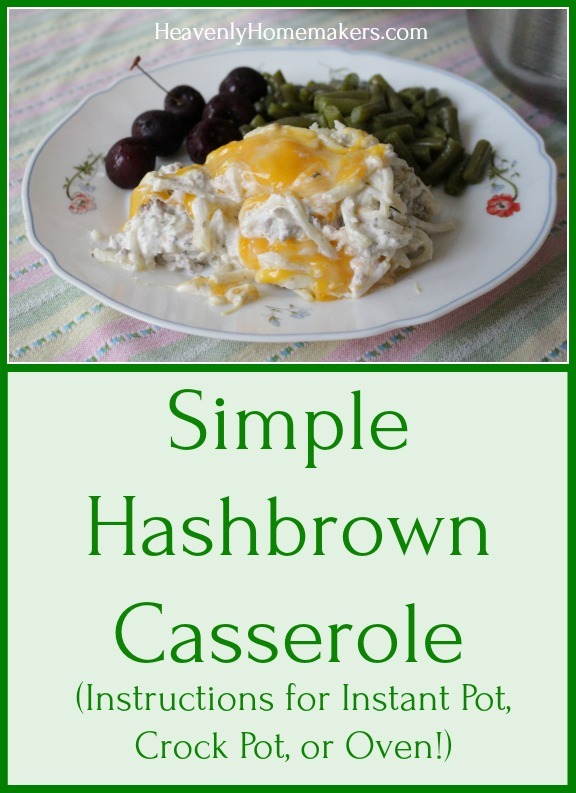 Here’s a quick glance at cooking times for this Simple Hashbrown Casserole so you can make your best plan on the day you make this. You need just five ingredients to make this recipe! One of the ingredients is this Homemade Ranch Dressing Mix, which I love to have on hand at all times. Another ingredient is cooked meat. 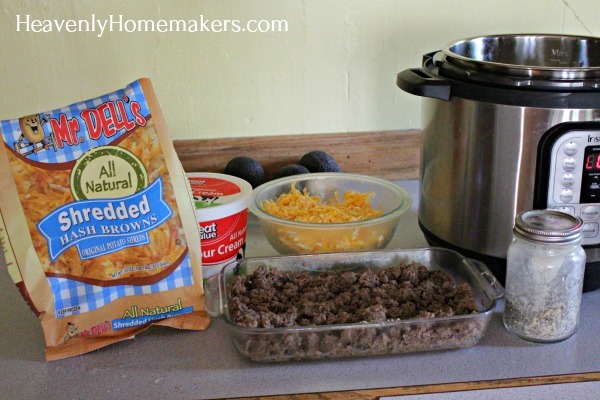 This time I made hamburger meat in my Instant Pot and I can’t wait to tell you about it! This is the easiest meat-cooking method there is – and possibly my “if you get an Instant Pot for no other reason, this is it!” shout out. I’ll share about this meat-cooking method soon! You might remember a variation of this new simple recipe: Bacon Ranch Hashbrown Casserole. You can most certainly make that recipe in your Instant Pot or Crock Pot following these instructions! And if you don’t love the “ranch” flavor this calls for, simply sub it out for any spices you like! Truly this recipe is most forgiving, and allows you to make it with any meat you prefer or have on hand, so you can create it to your family’s taste! 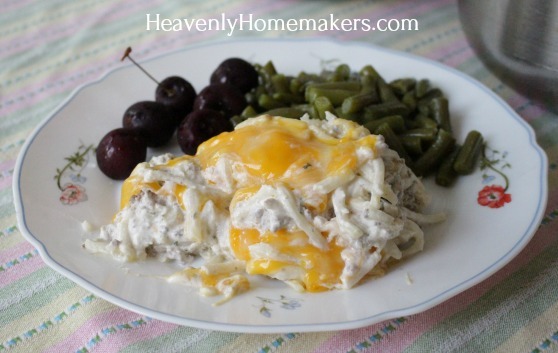 In a large bowl, stir together cooked meat, shredded cheese, sour cream, and ranch dressing mix. Instant Pot Method: Add ½ cup water to the bottom of the Instant Pot before adding remaining ingredients. Cook for 15 minutes on manual mode, hi pressure.